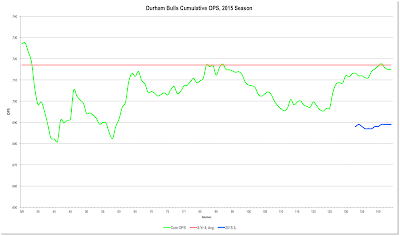 A good bit has been happening with the Bulls, including quite a few roster changes. 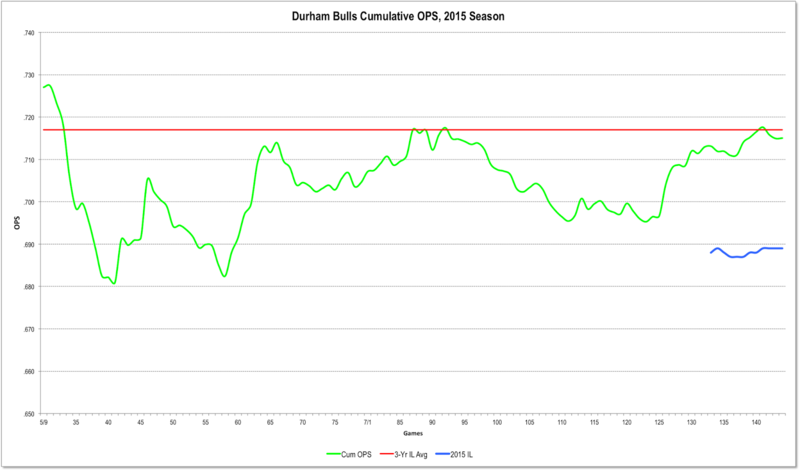 To summarize, the 2016 Bulls are going to be nothing like the 2015 Bulls. As a reminder, here’s a link to a list of the 31 hitters and 36 pitchers that put on a Bulls uniform last year. Boog Powell, who played in 56 games last year and was a very exciting Kevin Kiermaier-type player, was part of a trade to the Seattle Mariners. Too bad. I was hoping to see more of him in 2016. C.J. Riefenhauser, who did a fine job in relief in 2015 (29 games, 2.86 ERA) was part of the same deal. Taylor Motter, Mikie Mahtook, and Richie Shaffer. Unfortunately, three of our favorite guys were designated for assignment: JP Arencibia, Kirby Yates, and Brandon Gomes. Arencibia has signed with the Phillies; Kirby Yates is off to the Cleveland Indians; and Brandon Gomes has signed with the Chicago Cubs. Hak-Ju Lee, who has never seemed to really recover from his knee injury back in 2013, declared minor league free agency and signed with the San Francisco Giants. LHP Scott Diamond, our favorite 2015 starting pitcher, is off to Toronto. Joey Rickard got picked off in the Rule 5 draft, by Baltimore, which means he goes directly on their 40-man. Good luck. He was terrific at the end of last season. Jim Miller, a very reliable reliever in 2015, is off to Milwaukee. Jake Elmore is off to Milwaukee as well. Joey Butler, who started 2015 with the Bulls but spent most of the year with the Rays, signed with Cleveland. Robert Zarate, a very erratic guy and sometime Bull last year, is off to Pittsburgh. 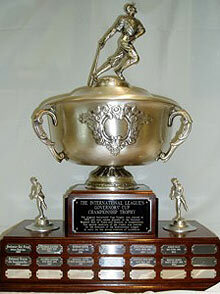 Congrats to Mike Birling though for winning the International League Executive of the Year award. Well-deserved. I see they’ve got a new tagline, "Known for Baseball, Famous for Fun" on web page. 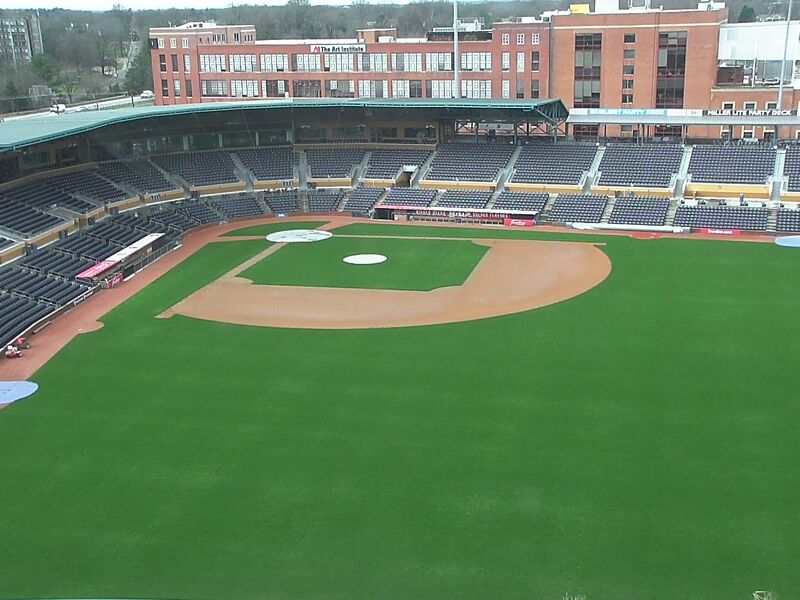 This mild winter appears to have treated the field very, very well. Lastly, I have very mixed feelings about the new safety netting that’s going to go up over the dugout areas (and in front of my seat). I spent one year in a seat behind home plate and found the netting a distraction. Not sure just how it will work out. However, I have to say that all too often I’ve seen folks down by the dugout, with children, paying absolutely no attention to the game. So maybe they do need to be protected from themselves. For myself, I have not been particularly worried since Jon Weber left and I haven’t had to dodge one of his bats. From the image it doesn’t look like they’ve started work on that project yet. A few years back we headlined Carl Crawford as the richest ex-Durham Bull ever. That record, a mere $142,000,000, has been crushed. The same monster checkbook that bought Crawford just bought David Price for $217,000,000, who will go to work for the Boston Red Sox next season. 6th Inning: Hak-Ju Lee slides safely under/past the tag of Knights’ 1B Dayan Viciedo as pitcher Brad Penny and 2B Michah Johnson cluster in frustration. Thanks, Sue! 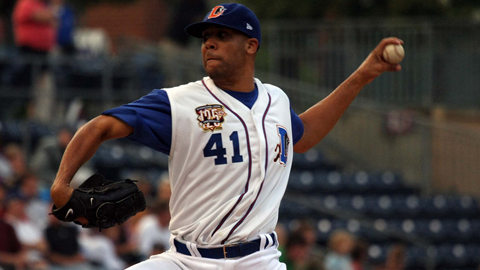 Each of the three Durham Bulls pitchers allowed at least one earned run last night and that was enough to break the streak. Those fans inclined to seek good news at the far reaches of probability, possibility, and plausibility are slowly coming back to earth. But wasn’t that a pretty run? 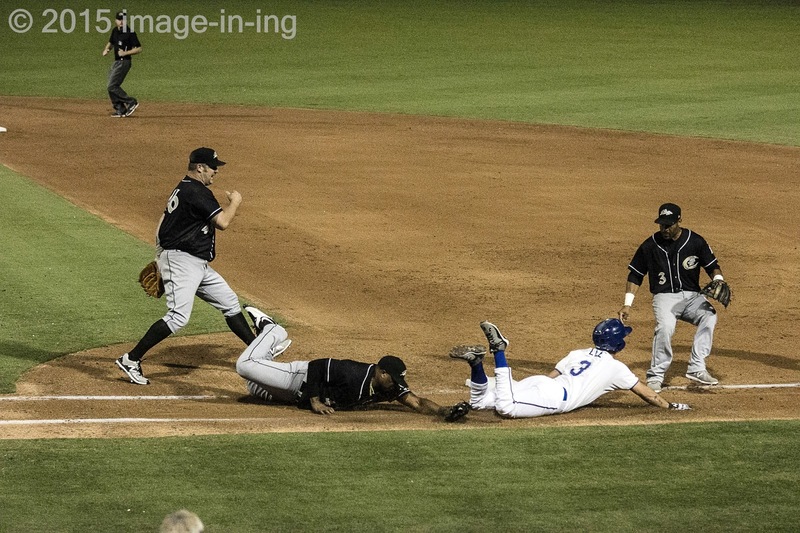 About that photo up at the top by our good friend Sue Roth (who sits not far from first base, obviously) — I am not a fan of even the idea of sliding into first base and have been pleased to see it seemingly disappear from most player’s trick bag. But this time it made sense. As the first batter in Durham’s piece of the 6th inning, Hak-Ju Lee made a hard bunt between pitcher and first base. Thereafter there was a gathering of Knights: Pitcher Brad Perrry, First Baseman Dayan Viciedo, and Second Baseman Micah Johnson. Viciedo has the ball and Lee is sliding under and past the tag to reach the base. A fraction of a second later Johnson kicks Lee in the head and they had what I hope was a friendly discussion about that. Back to the rest of the game. Matt Moore had brilliant innings followed by not very good innings all night. And easy 1st inning, then two walks and two K’s in the 2nd. In the 3rd a single, a run-scoring double, and two wild pitches let two runs score. Three up, three down in the 4th. Same in the 5th. In the 6th a single, then an error by Richie Shaffer, and another single loaded the bases. Moore hit the next batter for another run. Kirby Yates gave up a run on 2 hits in his 1⅔ innings. Andrew Bellatti gave up a home run in his inning. But the hitters did have their chances. After being absolutely shut down for 14 outs, a double by Cory Brown broke up the perfect game Brad Penney had going. Then in the 7th the Bulls scored two runs before Mikie Mahtook struck out with the bases loaded. 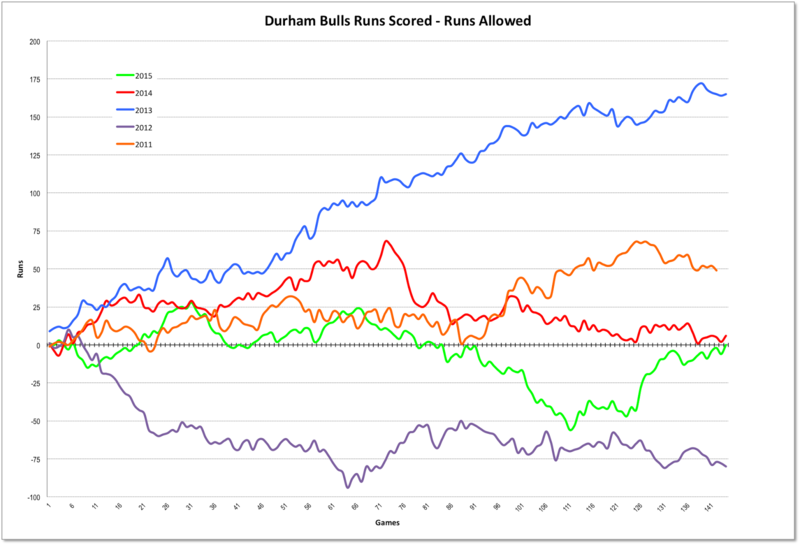 That got the Bulls within a run, but the Knights got two more runs before the Bulls even threatened in the 9th and that fizzled out. Nevertheless, an 8-game run is a big deal. 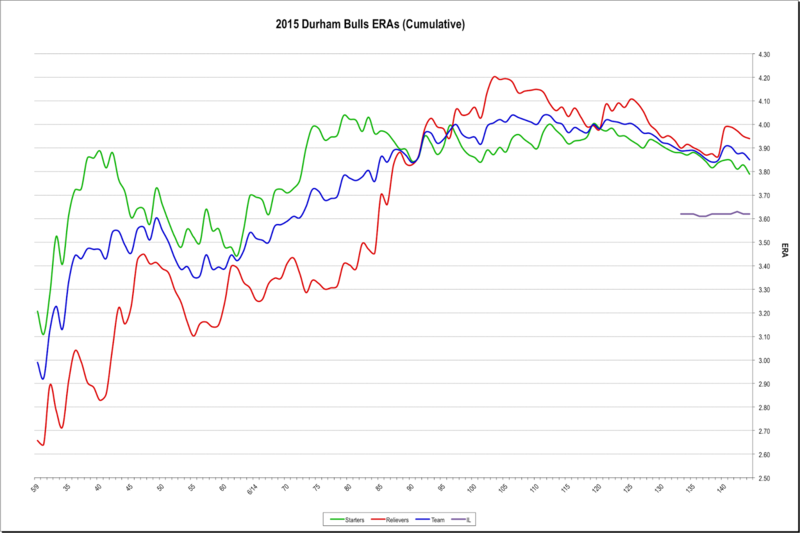 Thanks, Bulls, for the thrills as the season winds down. The Bulls kept their streak alive at the DBAP last night. Remarkable. Both managers pushed their luck, though. Jared Sandberg got away with it. The Knights’ manager, Joel Skinner, did not. The question both managers faced was how long to leave a struggling pitcher in the game. The Bulls Scott Diamond got out of a bases loaded situation in the 4th inning with a lineout to left field. However, in a bases-loaded no-outs situation in the next inning, he got the first out on a popup, his second out on another popup, but the next batter singled and two runs scored. By that time Diamond had faced 27 batters and thrown 90+ pitches. The Bulls were down 3-2 going into the 6th. Over on the Charlotte side their pitcher, Kyle Drabeck, went into the 7th inning, but a walk and two singles later he faced the same situation, bases-loaded, no-outs. He wild-pitched in a run, got a K, but then a two-run single by Luke Maile put the Bulls ahead 5-4. He left the game at 27 batters and 104 pitches. Neither starting pitcher had stellar Game Scores: Diamond’s was 38, Drabeck’s was 40. Kudos to Luke Maile for his game-winning single in the 7th and to Mikie Mahtook for his two-run double in the 3rd. J.P. Arencibia started at catcher for the Rays last night and Joey Butler, who helped win the last two games for the Bulls, joined him in the lineup as the DH. The two of them made the difference in the Rays win before just 9,000 fans in St. Petersburg (the Bulls had almost 8,000 in Durham). Arencibia drove in run with a sac fly. Butler hit a game-tying RBI and then scored the winning run on a wild pitch. Along with Butler leaving, José Dominguez is back. He passed through waivers. I didn’t notice him in the bullpen last night, but he was probably there. You can get headaches trying to figure out the combinations and permutations of the next 11 games. 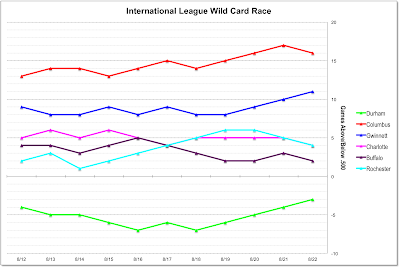 However, I think that it’s safe to say that Columbus and Indianapolis have a lock on the Wild Card and IL West championship. 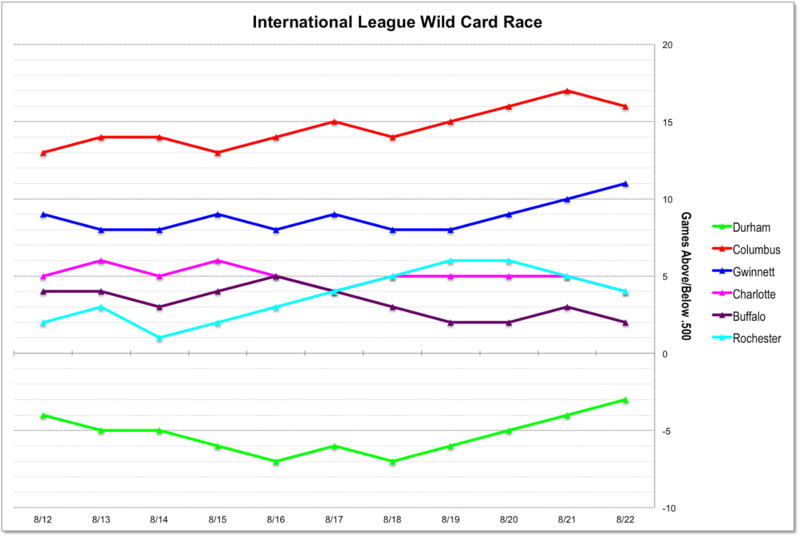 Indianapolis certainly looks like the winner, but one or the other would have to lose almost of their remaining games to fall out of the wild card lead. Standings. Norfolk, on the other hand, has lost their last four games and is only ahead of Gwinnett (who they are now playing) by two games. 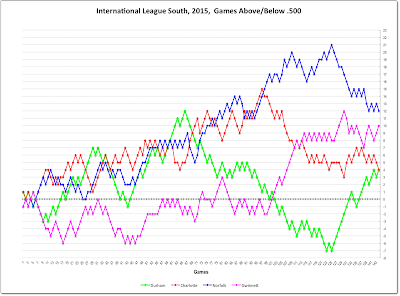 Here's the pattern since mid-season (game 73). 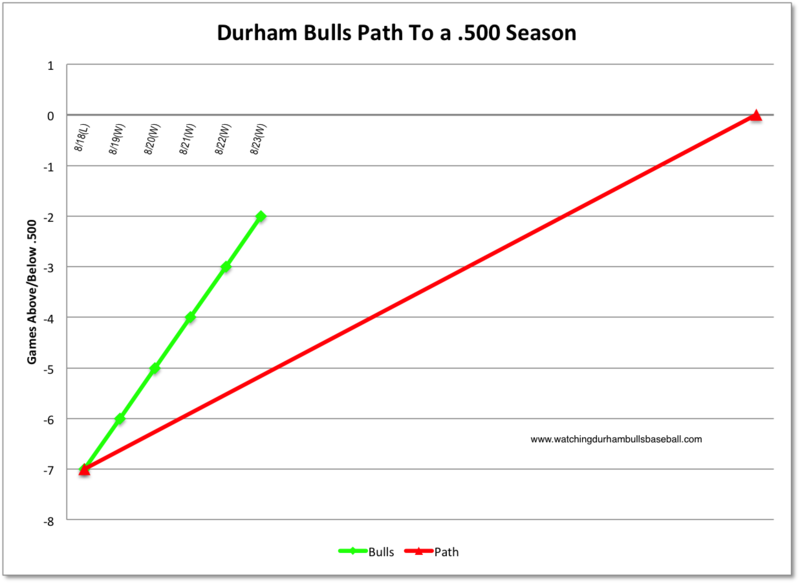 The Bulls reached .500 for the first time in almost exactly a month (July 26) with their seventh win in a row, the longest streak of the year. On game six of the run, Tuesday night, Joey Butler broke it open in the 11th inning, and he had a lot to do with Wednesday afternoon's win. Names we’ve grown to love this last week looked terrific, Taylor Motter, Richie Shaffer, and Butler all had hits in the 11th and Hak-Ju Lee brought in the third run with a sacrifice fly, a run it turned out the Bulls would need as Kirby Yates made the bottom of the 11th a bit more thrilling than necessary. Then yesterday Joey Butler was at it again, this time with two home runs in support of Bradin Hagens. Along with Mikie Mahtook’s 4 for 5 day at the plate, a timely sacrifice fly by Taylor Motter, and a disruptive stolen base by Lee. Both games were also bit unusual for Jared Sandberg’s tactics or, rather, his use of some traditional tactics he seems to have avoided this season. For example, he has only called for 8 intentional bases on balls all season. He did so in the bottom of the 9th on Tuesday and it worked. Similarly, he has not been a big fan of pinch-hitting, but yesterday in the critical 7th inning, when the Bulls were behind 3-4, he put Nick Franklin in to bat for catcher Mayo Acosta. Hak-Ju Lee had singled with one out and Acosta has a dismal batting average. A few pitches into the at bat Lee stole second base and Franklin then drew a walk (note that the Tides’ catcher set up well off the plate for a 3-1 pitch so it was an unintentional, intentional in hopes of getting a double play). When Mikie Mahtook hit a double to bring in Lee and Franklin and the winning runs, Sandberg looked like master tactician. Pitching? Blake Snell was terrific on Tuesday and Bradin Hagens got his second win in a row, getting past two important errors by Bulls fielders. J.P. Arencibia went up to the Rays! Congratulations. It turns out that his recent time behind the plate with the Bulls will serve him well. See this link for more than you probably want to know about how they pulled off the roster moves. This has been a remarkable run. 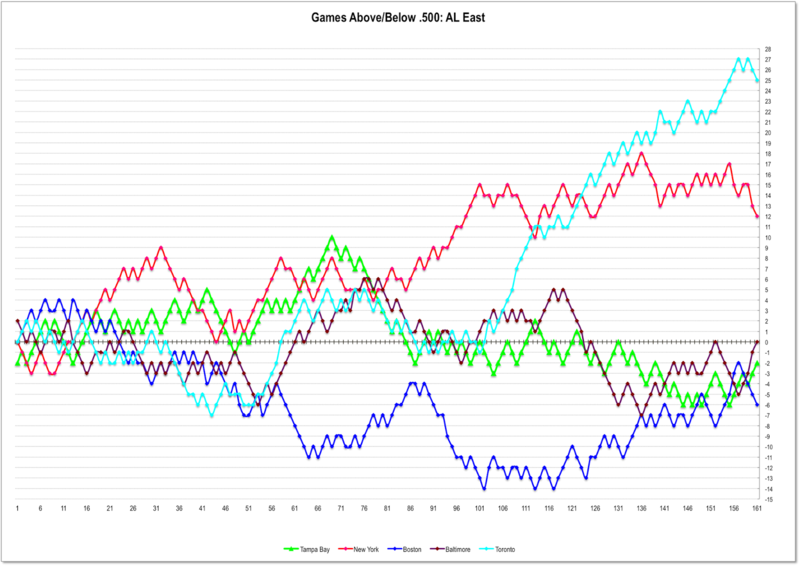 The team ERA dropped from 3.99 to 3.90 (with 132 games played, it takes a lot to move the averages that much). The starters went from 3.92 to 3.88, while the relief crew outdid themselves with a drop from 4.09 to 3.93. 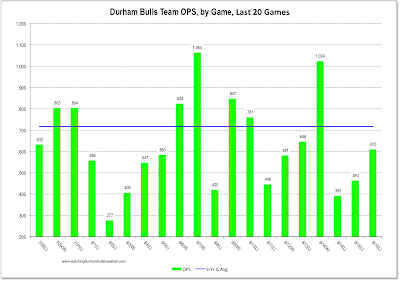 The hitters moved the team seasonal wOBA from .317 to .321 over the seven games. That may not seem like much, but, again, at this point in the season that’s a big move. 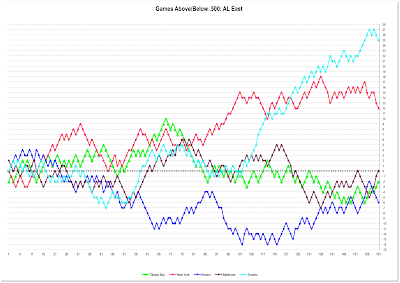 The team wOBA hasn’t been that high since July 22. 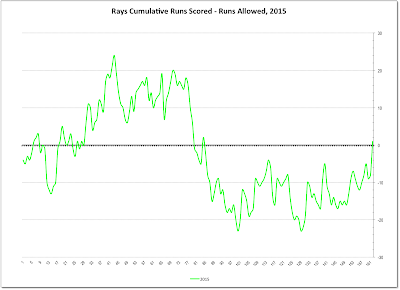 The last time the team pitching has been in this range was back on July 16th. 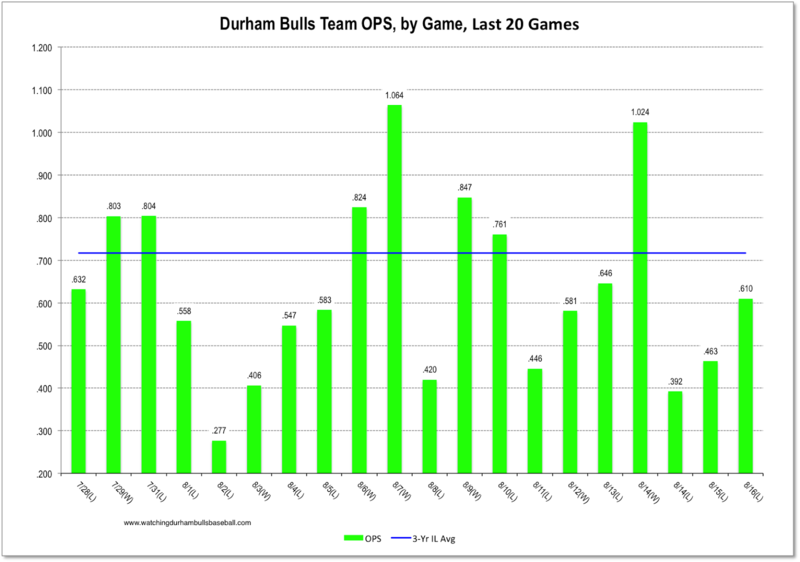 The rest of the Bulls dozen games are against South Division opponents and 9 of their final 12 games are at home. 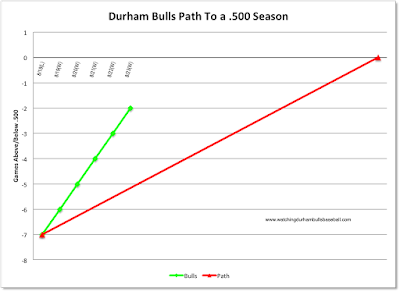 The Bulls start with Charlotte, have a couple of games against Gwinnett, a few more with Charlotte, and end up with Norfolk. Recently Norfolk has fallen off its terrific run to the top and Gwinnett, which had been making quite an attempt, has also fallen off. With roster turmoil coming for all four teams, who knows what the future holds. For the time being, let’s celebrate a return to .500 baseball. About this time each year we try to make the call-up case for one or more member of the Durham Bulls who is not on the Rays 40-man roster. Folks who’ve been around for a while will recall Chris Richard, or Leslie Anderson, or even Jon Weber. You will also note that WDBB has been notably unsuccessful in its endeavor — but not for lack of trying. We listed the current Bulls who are on the 40-man a couple of days ago. 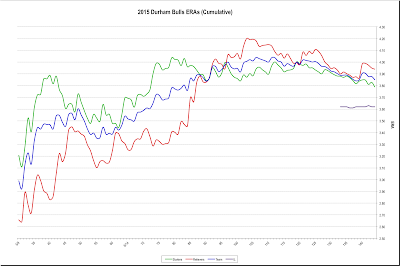 We tend to look at these players from the narrow-minded view of the Durham Bulls, recognizing that Durham Bull-ness is not a particularly big deal to Rays management. 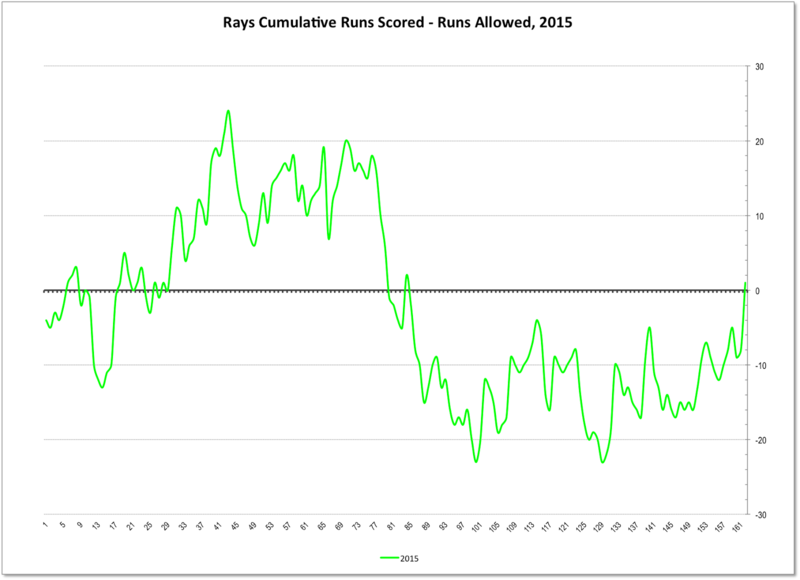 If the Rays are going to do what it takes to put a player on the 40-man (i.e., dump a player who is now on the 40-man), they need a reason. Well, we’re not going to try to make that argument for them. 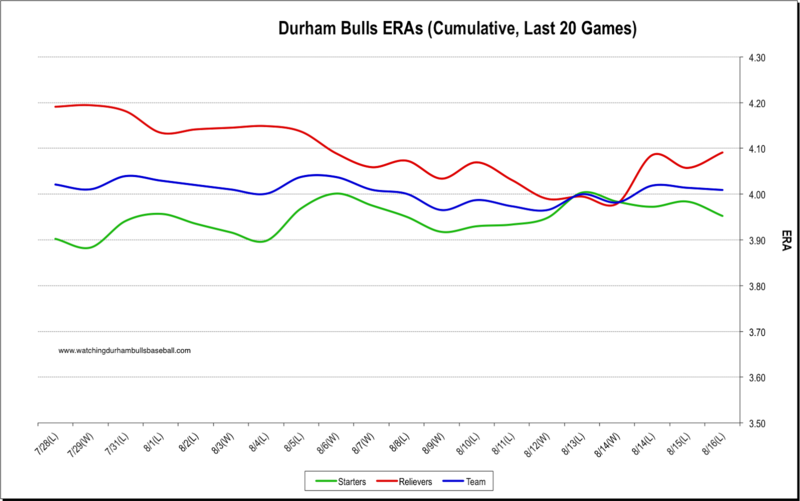 What we want to do is ask you, Bulls fans, who’s the guy you think should be in a Rays uniform this September because he was a terrific Durham Bull. And my choice — Taylor Motter. Most of statistical reasons are obvious, especially the wRAA above. In addition to these stats, he leads leads the team (and the International League) in doubles with 36. He leads the team in RBI with 66 and that's 5th in the IL. His number of stolen bases (26) also leads the team and that's tied for 5th in the IL. Although most of his 113 games have been in right field, most recently he's been spending a good bit of time at 3B. He's got games at 2B, SS, LF and CF as well. And his hair is almost as good as (better than?) John Jaso's. So, he's our 2015 non-roster pick among the hitters. We'll get to the pitchers another day. Five in a Row; Is There Hope for the Future? For the first time in what seems like a very long time I was able to get to the DBAP to watch a game. I certainly didn’t expect the Bulls to pull off a 5-in-a-row, but they did. This was the best at-home series of the year. The Bulls’ were hitting homers last night, Nick Franklin, J.P. Arencibia, and Hak-Ju Lee in the first three innings. But it was Lee who had the big night at bat, 4 RBIs. Everett Teaford had his best start in a very long time. In fact, the last time he had a Game Score as good as last night (58) was in a no-decision game back on June 16. Nice to see him in good form. Particularly impressive was the moment in the 5th when the umpire apparently decided to ignore the pace of game rules and let two Columbus batters in a row step in and out of the box numerous times. Both batters drew walks, but Teaford managed to sort himself out and get out of the inning unscathed (we won’t count the inning-opening home run). My first time seeing new guy Parker Markel. He looked pretty good with his 3 K’s over 2 ⅔ innings. At a guess, however, he’s the odd man out when José Dominguez returns. Dominguez passed through waivers yesterday and will be coming back to the Bulls. For the first time in recent memory Boog Powell was not the leadoff batter, Mikie Mahtook was and Powell was second. However, he did start toward the plate at the very beginning of the game and came back toward the dugout with a big grin on his face. Habit. These five wins in a row got broadcaster Patrick Kinas running the math a bit. His colleague Scott Pose wasn’t challenging the numbers, but he also wasn’t buying into it either. Standings. Let’s take a look. 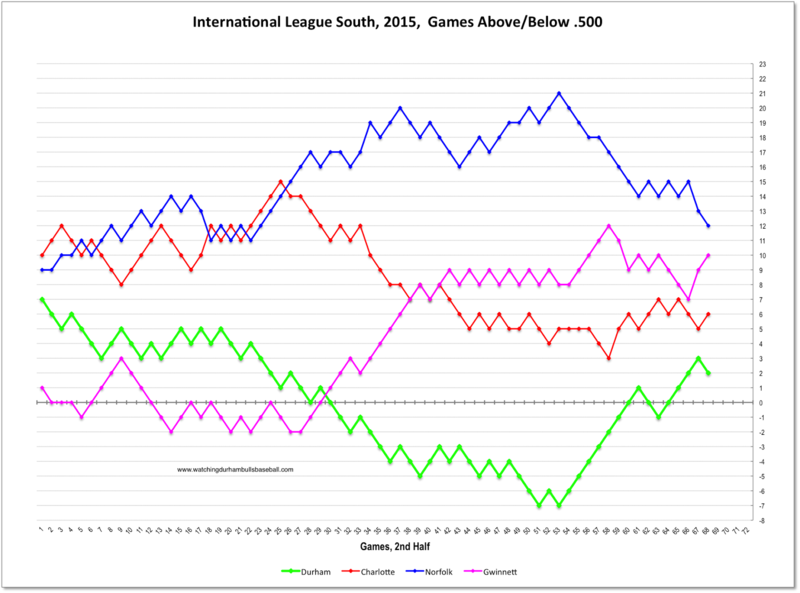 The rest of the season the Bulls are playing against International League South Division teams. Five against Norfolk (2 away, 3 home); 7 against Charlotte (4 home, 3 away); and 2 against Gwinnett at the DBAP. 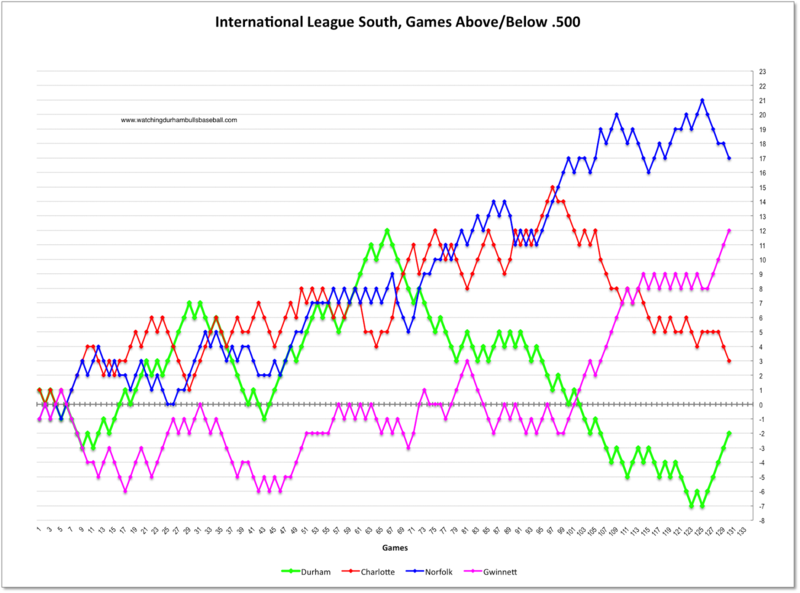 All of those teams are above .500 and Gwinnett in particular has been hot lately. 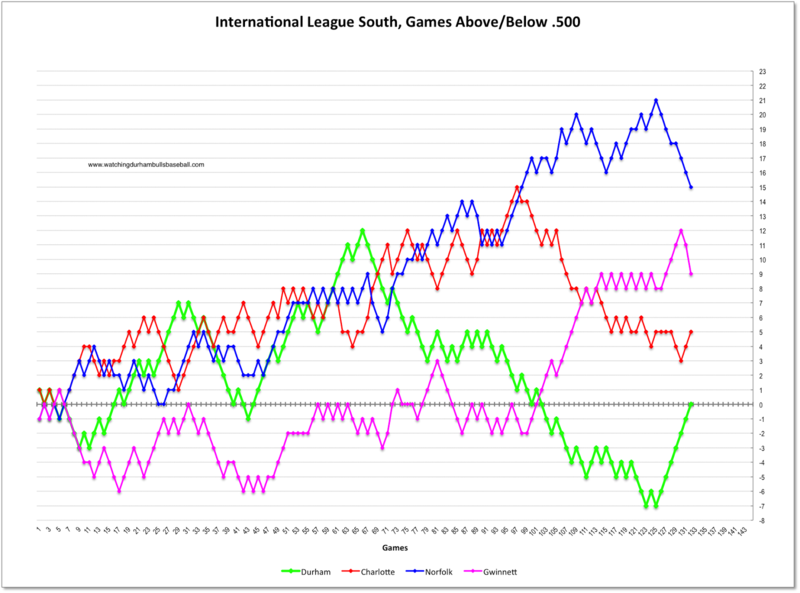 Half of the remaining games will take place place after the September call-ups and it’s hard to say what Chicago, Atlanta, Baltimore, or Tampa Bay will do to their South Division teams. Yes, the Bulls are hot, but so are the Braves. 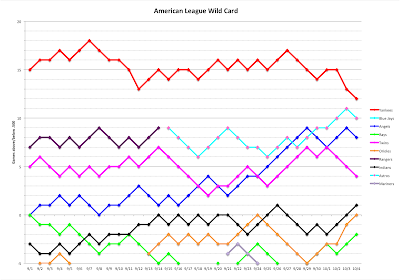 You have to think that Gwinnett could make a run at the top spot, but no one else is likely to sneak into the wild card slot. Could something happen? Sure. Likely? We can only hope. 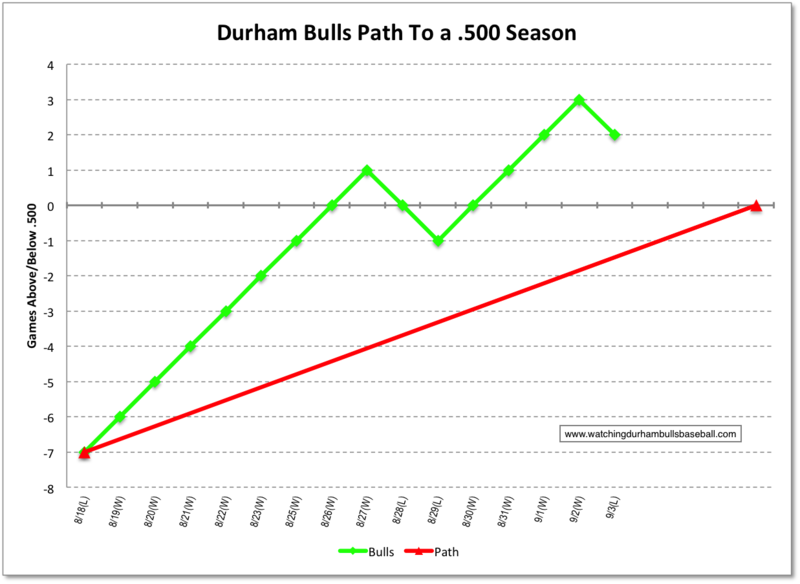 A more reasonable wish is for the Bulls to establish a winning season. That’s what this chart will be showing. Getting above the 0 mark is a winning season. And that, given this July and August, would be a significant accomplishment. The game story from last night is, as it should be, Matt Moore’s 16 Ks (a Bulls record) and the 4 more by the relievers to set a season team high of 20 Ks. Certainly very fine performances by Matt Moore, Robert Zarate (who got the win) and Kirby Yates. And yet after Moore gave up the home run in the 6th, the Bulls were losing the game. So, yes, there was some great pitching on both sides until the 7th. However, the Clippers put in Michael Roth to take the place of Toru Murata and Roth never got an out. In fact, it wasn’t until his 13th pitch that he even threw a strike. That is, he walked the bases loaded on 12 pitches, something of a pitching accomplishment all of its own. A Boog Powell sacrifice fly brought in the tying run and Roth was pulled from the game. A Nick Franklin single brought the go-ahead run in and a J.P. Arencibia single brought in two more. The last time the Bulls won four games in a row was back in June, from the 7th to the 12th, but only two of those wins were at home. We have to go back to the end of May for four home wins. And lots of folks are showing up for the games as well. A feature of the Bulls’ recent success has been plate discipline. They’ve drawn 21 walks over the last four games. Before we get too excited about that, however, we have to also note that they have struck out 35 times over the same four games (the Bulls lead the IL with 1,071 Ks on the season). This win over Columbus is a modest help to Gwinnett in the wild card race. 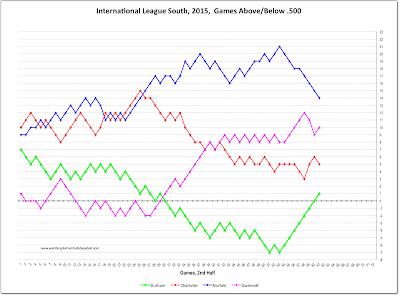 The Braves are still 2½ back, but aren’t out of it. 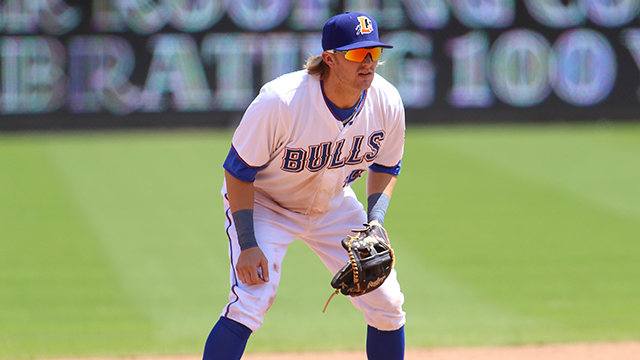 Infielder Taylor Motter took the mound in the top of the 14th after the Bulls had run out of pitchers. He set down the Mud Hens in six pitches and the sense was that things had changed. 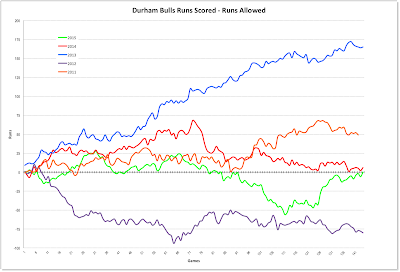 The Bulls had been putting plenty of runners on base (they stranded 11 on the night), but couldn’t push anyone across. Until the 14th. Mikie Mahtook doubled, Richie Shaffer got an intentional walk, and Nick Franklin doubled Mahtook home. 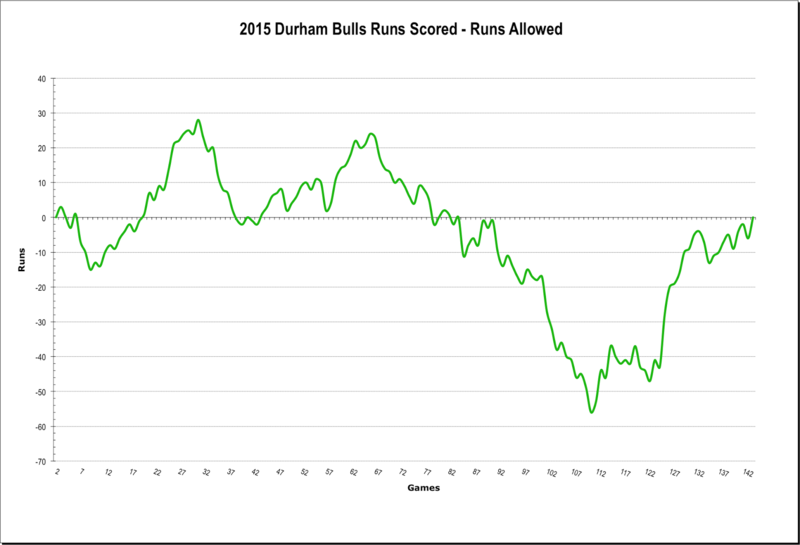 That ended the longest game of the year for the Durham Bulls. For the first time since early June the Bulls won three games in a row. And throughout these three days the team seemed loose and ready to play. Other good things that happened along the way were Joey Butler's home run (his 4th as a Bull), Richie Shaffer’s 19th home run (in 60 games), the smart base running by Shaffer in the 8th on a Nick Franklin sacrifice fly that tied the game, and solid relief work by Jim Miller, C.J. Riefenhauser, and Jhan Marinez (two days in a row). Worrisome? That would be Scott Diamond's 6th inning. Who’s going to St. Petersburg on September call-ups? Your guess is as good as mine, maybe better. But we have to start with players on the 40-man, so here’s that list. 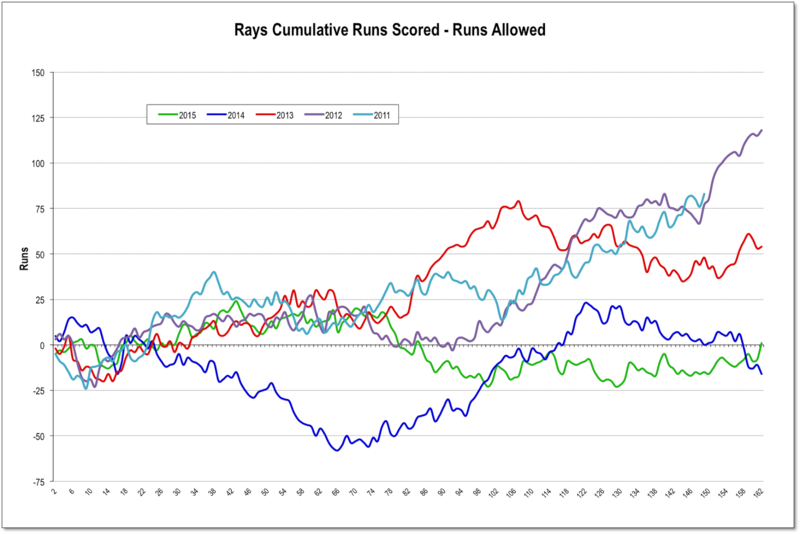 If anyone else is to be called up then room will have to be made for him one way or other (and the Rays are pretty good and finding that “other” gimmick). Note that this list is constantly in motion. The hitters just kept hitting. Everyone, except Hak-Ju Lee, got a hit. Mikie Mahtook had what may have been his best night of the year with a double and three singles. After twice getting cheated of a home run, once at the DBAP and once in Indianapolis, J.P. Arencibia got his 21st of the year over the Monster. 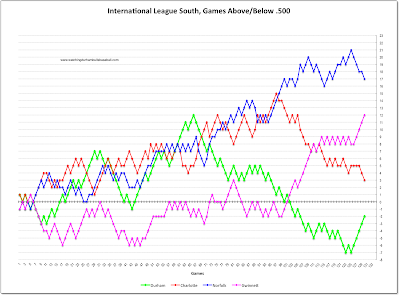 Arencibia is the leading home run hitter in the International League. Taylor Motter got a double, his 36th, and he leads the International League in doubles. Bradin Hagens, who had accumulated five losses and a no-decision since the All-Star break, was the beneficiary, although he did just fine on his own. He gave up just 1 run in his five innings. Robert Zarate had a much, much better inning than the awful oddity he had in Louisville the night before last (1 hit, 2 walks, 2 hit batsmen, 3 earned runs, 3 Ks). A clean three up, three down. New guy Parker Markel arrived from Montgomery and pitched a clean 9th. It was the AAA debut of the 24-year old. 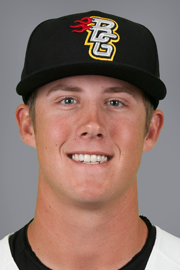 He has 53 relief innings in 42 games with the Biscuits and a 3.23 ERA. Markel was the only transaction reported yesterday. 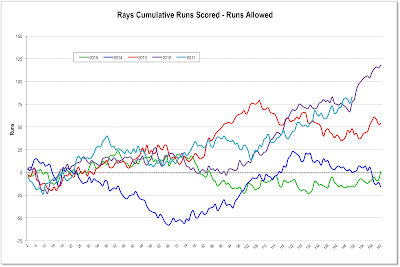 But with former Bull Jake McGee going on the DL for the Rays, we’d have to guess that there will be some more shuffling soon. One source is reporting that it’s Enny Romero. We’ve mentioned Matt Buschmann a lot the last couple of years. Local baseball writer Adam Sobsey did a fine background piece on him in a recent Grantland issue. 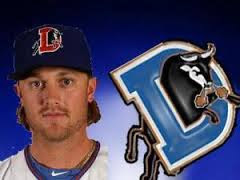 Buschmann was recently seen at the DBAP coaching first base for the Louisville Bats and then, after a trade, on the mound for the Norfolk Tides. A complete game, 1-hit shutout is a big, big deal. Congrats to former Bull Chris Archer. Stories here and here. As the line score shows, this was an amazing game for the hitters and pitchers. Every Bull got at least one hit: 4 doubles, a triple (Boog Powell), four home runs (two by Richie Shaffer, one by Nick Franklin, one by Taylor Motter), and 11 singles. Cory Brown was the only Bull who didn’t get at least one RBI. An amazing, year’s best, night: 38 total bases, team OPS of 1.404, team wOBA of .577. 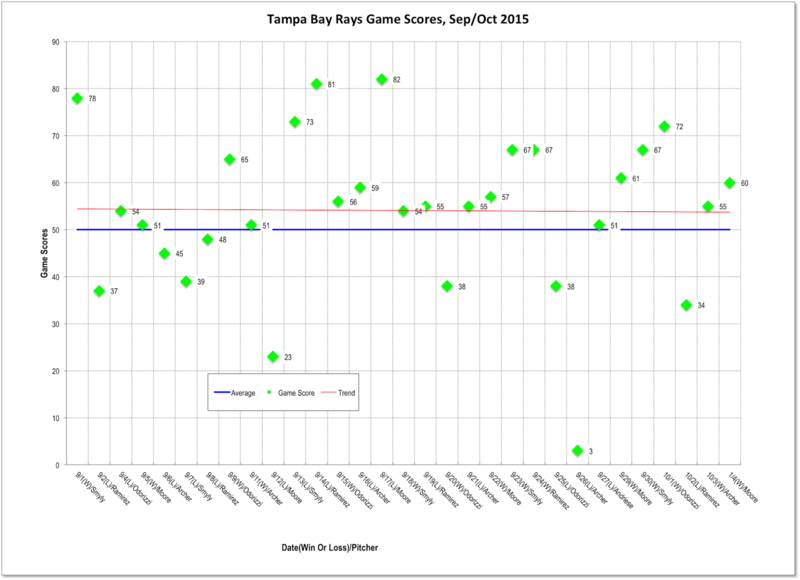 Meanwhile, Blake Snell continues to show his stuff. He only gave up one hit (a solo home run) in 5 innings of work. I can’t keep track of all the transactions. 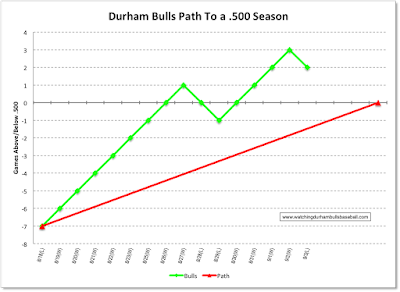 The Bulls have had 189 of them this year! That's 1.5 transactions per game! Pretty sure that I haven’t mentioned at least some of these. José Dominguez was designated for assignment (the Rays needed his 40-man slot, Smyly finished his rehab). No word on his status. Note that former Bull Dale Thayer is in the same "DFA Limbo" status. Leonardo Reginatto went back to Montgomery. Joey Butler came back to the Bulls from Tampa Bay. Edward Teaford went to Hudson Valley on the 15th and came back on the 18th. Hope he enjoyed the trip. 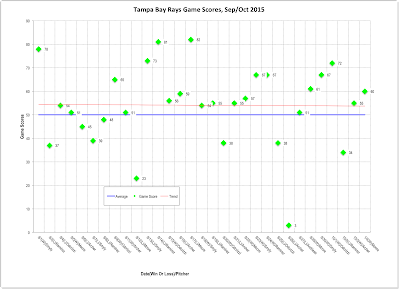 Enny Romero was called up to Tampa Bay and I think he’s on his way back. Matt Andriese was called up (he took the loss in the 13th inning last night). Richie Shaffer is back, with his bat, obviously. Dylan Floro has gone on the disabled list. Meanwhile, I don’t think that I have pointed out that Vince Belnome was signed by the New York Mets and is playing with their AA team, the Binghamton Mets. Doing OK. The Biscuits are doing well. Scott Diamond was back in a starting role (after following rehabbing Tampa Bay Ray Drew Smyly for a couple of games). He did just fine, although he did get charged with an unearned run. Dylan Floro and Robert Zarate (back from the DL), however, did not. Floro might be getting the hang of this reliever gig, though. He took the loss, but was better than his last two times out. Was Zarate ready? Does not look like it. He’s given up 4 runs in his two innings since his return. J.P. Arencibia was at catcher last night, the 8th time this season. Joey Butler is back after an extended stay with the Rays. He was in 74 games with the Rays and just 24, so far, with the Bulls. Plus, although I’m sure it makes sense to somebody, I’m not sure why he’s back. At a guess some sort of matchup/platoon thing. The N&O’s Monday minor league feature today has a nice article on the bull, as in “Hit Bull, Win Steak”. 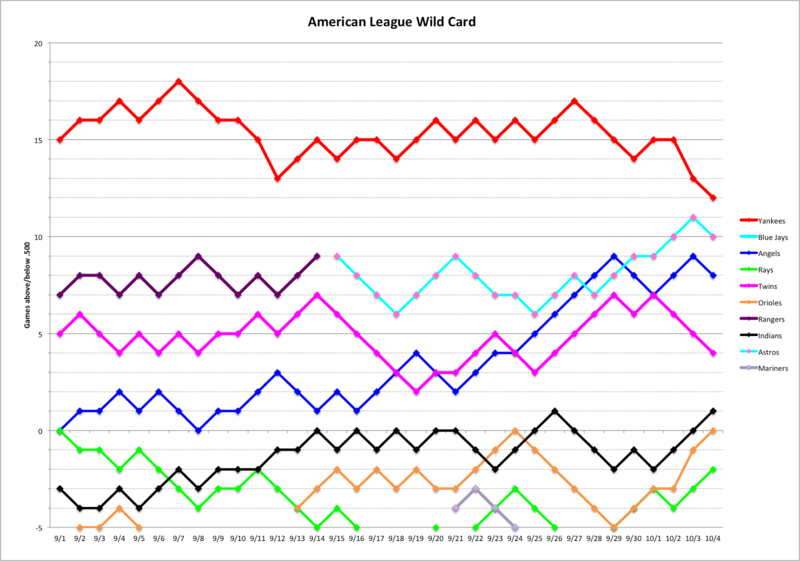 Interesting take on this year's season over at Triangle Cards podcast. Worth a listen. Pitching and Hitting over the last 20 games. Pitching chart is cumulative ERA; the hitting chart is OPS on a game-by-game basis. The Bulls were 7-13 over the 20 games. 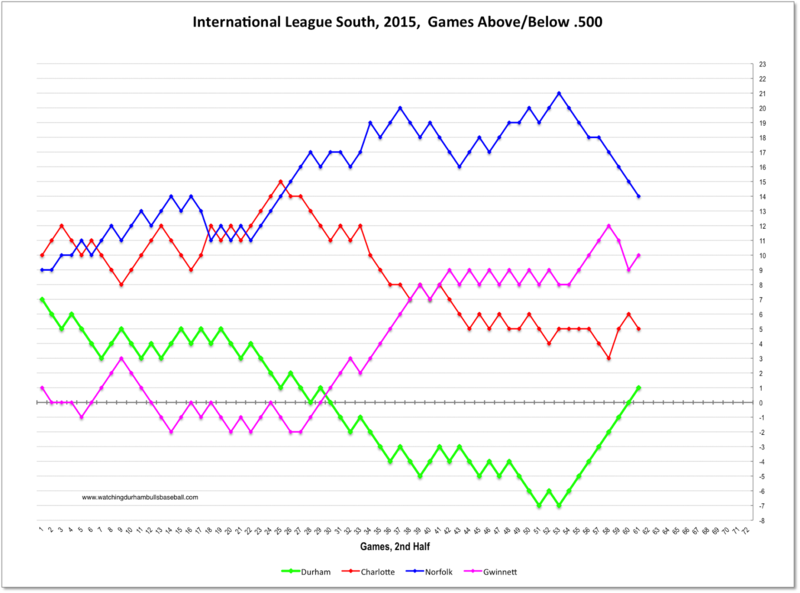 The relief crew was showing some improvement for a few games, but are now drifting back upwards. 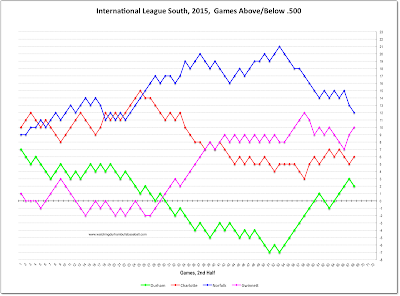 The hitters are roughly .100 below the International League average OPS.